The modern structural steel buildings are made with profiles (beams, U-channels, angles, tubes) that are joined and bolted one to the other. Straight and mitred cuts are carried out with modern sawing systems, shaped cuts on profile edges or on web and flanges, instead have always been a problem that is today, more than ever, brilliantly solved thanks to the Ficep thermal coping robots. 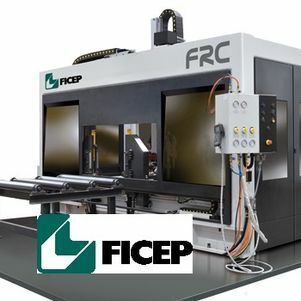 The Ficep robotic coper allows the torch to move and orientate (using plasma or oxyfuel cutting). It is also possible to carry out coping of programmed shapes previously stored in the CNC library. 2. These real values are compared with the theoretical ones stored in the CNC part program; any discrepancies are automatically corrected in real time and the torch will move to the exact position to start the cycle grace to the new generated part program. No time is lost to re programme the shape. The carriage allows operations such as splitting, long inclined cuts for haunches generation, castelating, etc.. due to the capacity to accurately control the axe along the length of the bar. optimized nesting and multing of different pieces with common cuts is allowed for minimal material wastage. Machine chassis consisting of four columns in electrowelded steel tubes to support the robot and precision rack and pinion linear guides to move the torch allow the highest repeatability and accuracy in these complicated cutting operations. Semi-spherical cartesian robot with 6 controlled axes holding the oxycutting and plasma torch is a guarantee of easy programming and control also at the workshop level. Automatic vices to guarantee perfect material clamping even during cuts where the material moves longitudinally. Hydraulic alignment device between the first two rolls of the infeed rollerway. System for detection and automatic adjustment of dimensional tolerances. Plasma cutting system with Hypertherm power source increases the cutting speeds and performances of the robotic cutting cell. automatic torch changer allows for minimum set up time when passing from oxitorch to plasma torch and viceversa.